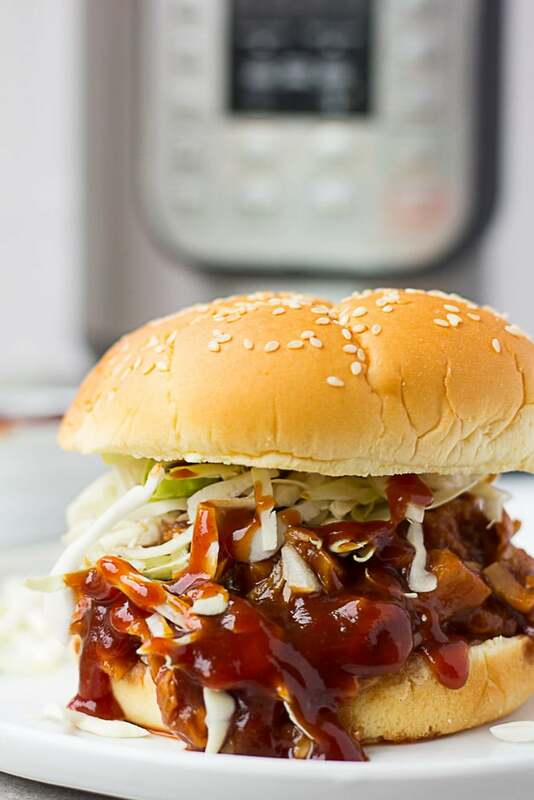 The easiest and most delicious Pulled BBQ Jackfruit Sandwiches, made in the Instant Pot! A perfect meal for the middle of summer when it’s too hot to turn on the oven. Have you guys tried jackfruit yet? I was hesitant for so long, and I don’t know why now! This stuff is pretty incredible and totally drool worthy. When you cook it up a little bit, it shreds really well and resembles pulled “meat”. It’s actually a fruit with little calories, and takes on whatever flavor you mix with it or cook it in. Perfect for BBQ sauce. I decided to give it a try in the Instant Pot, and what do you know, it turned out pretty great. (Recently I started making it with my homemade Quick and Easy Vegan Barbecue Sauce, but you can use store bought it you want). My kids give this a big thumbs up, though they’ve never had pulled pork before, so they don’t really get what it’s mimicking! 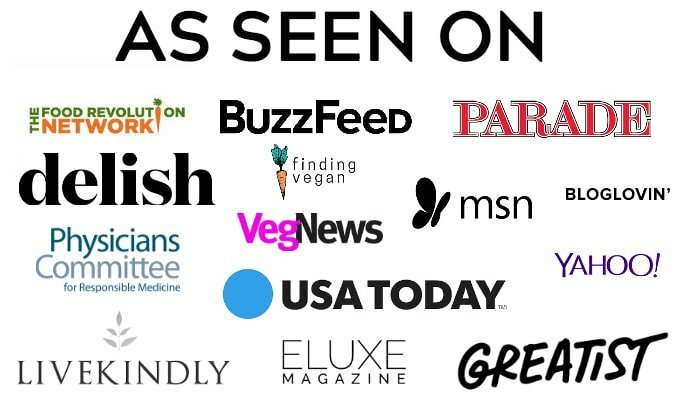 It’s kind of funny with kids who have never really eaten meat, they don’t crave the kind of things some other people do (like bacon, pulled pork, whatever it may be) that have been eating animal products for a long time. So if you are transitioning your family to plant based living, I recommend giving this pulled jackfruit a try! 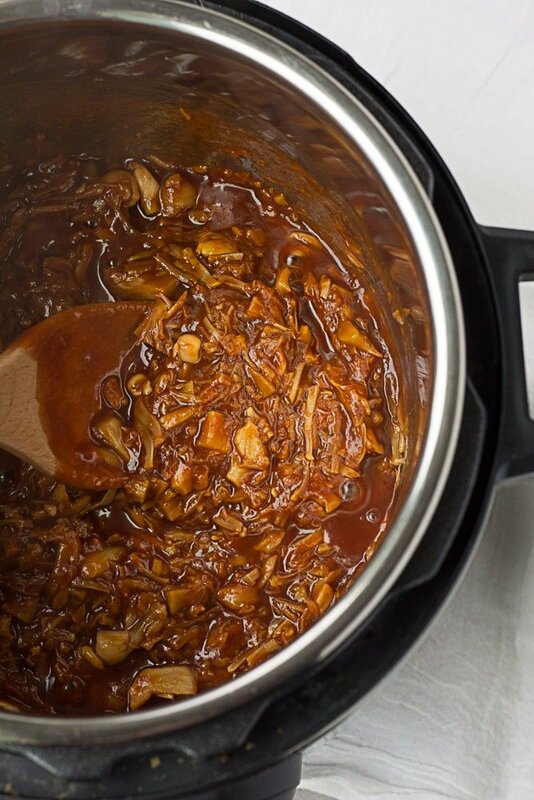 Here’s how to make Instant Pot Pulled BBQ Jackfruit. First, drain and rinse the canned jackfruit. Add the barbecue sauce and saute for a few minutes until warmed through. Serve on buns with shredded cabbage. Pulled BBQ Jackfruit made in the Instant Pot! Super quick and easy dinner that resembles pulled pork sandwiches. Use homemade barbecue sauce or store bought. 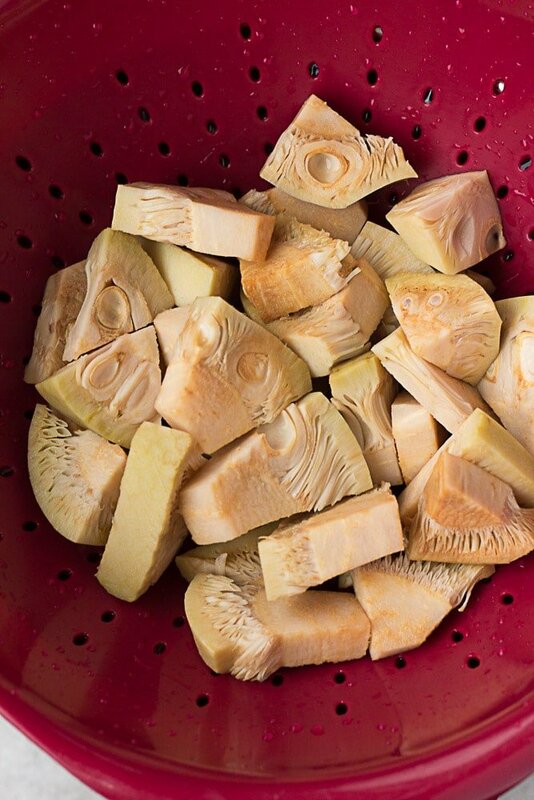 Prepare your jackfruit: Drain and rinse the canned jackfruit, then chop off the "core" portions and discard. 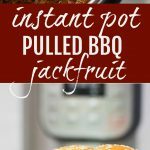 Add the jackfruit to the Instant Pot along with 1 cup of water. Put on the lid, seal, and set to high pressure for 5 minutes. Allow the pressure to release naturally, or if you are in a hurry you can manually release the pressure (carefully). 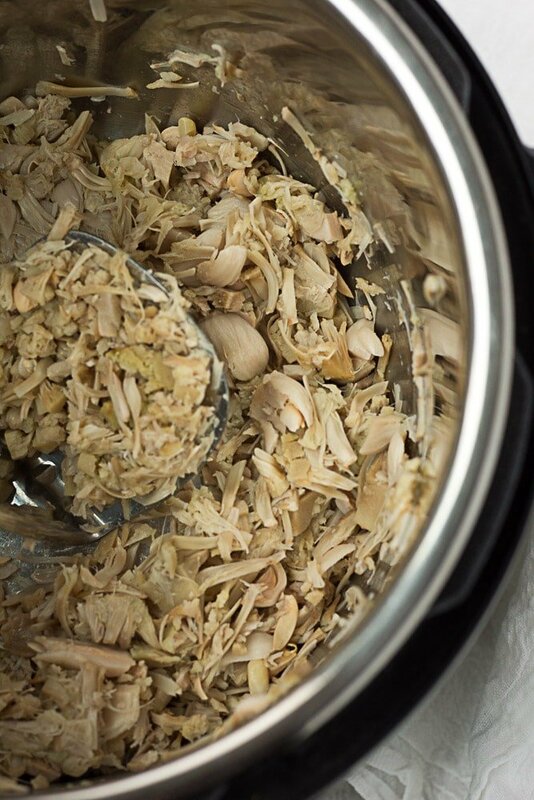 Drain the jackfruit, and then add it back to the Instant Pot. Mash with a potato masher until it resembles pulled meat (see photo above). Make the barbecue sauce following these instructions (unless you are using store bought sauce). 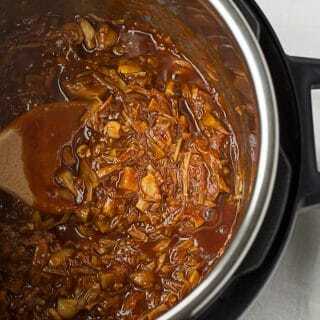 Add the barbecue sauce to the pulled jackfruit, and turn on the saute feature. Cook for 2-5 minutes until warmed through. Serve on buns with shredded cabbage. Oh yeah, it took me awhile to figure out jackfruit! I get mine at Trader Joes, it comes in 20 oz cans. I’ve also heard you can find the cans at asian stores. It is labeled as Jackfruit. Hi! I’m also in Portland and I agree, it has been too dang hot! I want to make a giant batch of this for my 2 year old’s birthday party this weekend and I’m wondering if you can tell me how many hamburger bun sized sandwiches can be made from this recipe. 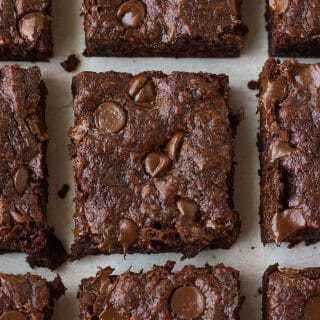 Hi Nora, thanks for the great recipe! Have you tried putting sauce in the instant pot while it’s pressure cooking? Would that potentially enhance the flavor? Hi Nora- Anxious to try this, but I don’t have an Instapot yet. Do you know alternative cooking instructions- maybe on the stove or even in a crockpot? Hi Lynda! 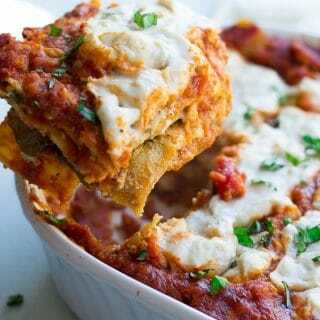 Yes, you could definitely make this on the stove, and I’m sure in the crockpot as well. On the stove, I would simply steam/boil the jackfruit until it’s tender, maybe 15 minutes or so. Then drain the water if necessary, and add in the barbecue sauce. I hope that helps! Thanks for the recipe. 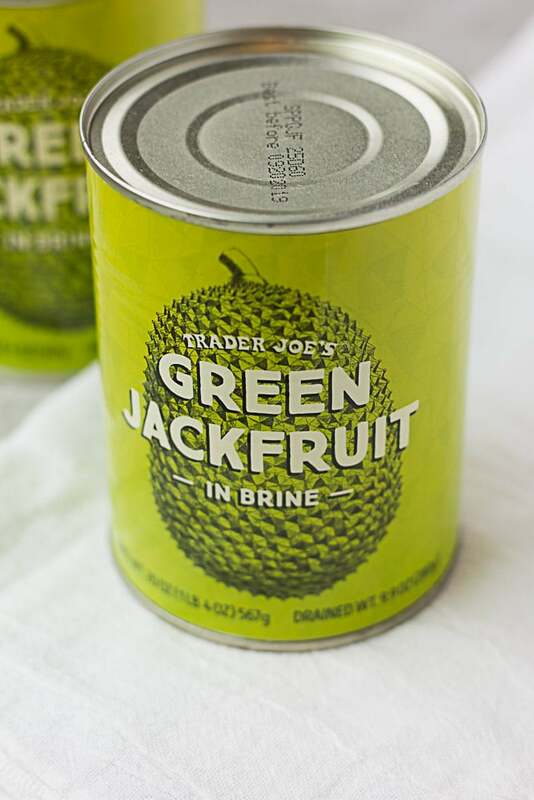 I noticed that the recipe calls from jack fruit in water, however the image on the website is of Trader Joe’s jack fruit, which is in brine. Which should we use? Will it make a difference? Most of the recipes that I have seen either use fresh jack fruit or say to use water, not brine or syrup based varieties. Sorry about the confusion! Actually, I will update the recipe to say “brine” or “water”. Brine is really just salt and water, I believe, so when I read the ingredients on the can it says “jackfruit, water, salt….”. But technically it is brine, so I will update the recipe. I always use the Trader Joe’s brand of jackfruit you are talking about. Thanks! So after a couple of tries I finally ended up doubling the pressure cooker time to 8-10 minutes. I also put less water and doubled the sauté time. Glad you enjoyed it, and your husband did, too! Have you ever done this with frozen jackfruit? I got some from Whole Foods frozen. Have been using it in smoothies. I had to try this Jackfruit pulled pork gag on my kids. I tried hard to hide the cans so they wouldn’t know the difference. I had the table spread with tater tots, ketchup, and the pulled pork looking sandwiches infused with their favorite BBQ sauce. My 18 year old boy took one look and said, “Are there beans in this?” I honestly answered no. “Is this even MEAT?” I asked him to try it and tell me. He squinted his eyes and took a large bite. “It’s not meat, but it’s pretty good!” He ate the whole thing and so did the whole carnivorous family! Ha Ha! Thanks for such a fun meal! I just discovered your blog and I am so excited. 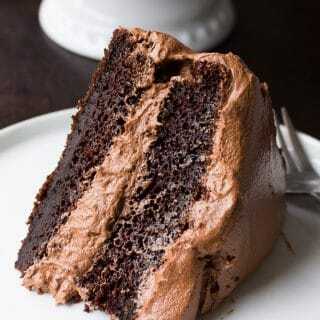 Every recipe I’ve tried of yours has been wonderful. I love it!! That is so hilarious. 🙂 I’m so glad everyone enjoyed, I hope you find many more fun family recipes to try! Thanks so much. I only have one 20 oz can on hand at the moment and a trip to Trader Joe’s is not on the horizon anytime soon. If I wanted to halve this recipe do I just cut the liquid in half but keep the pressure cooking time the same? Yes that should work just fine! Thank you.